Expect the unexpected from Conor McGregor as his team believes that the former UFC champion could return to the boxing ring to face Paulie Malignaggi. Malignaggi has been calling out McGregor since the two were sparring for McGregor’s showdown against Floyd Mayweather in 2017, due to footage of the Irish superstar dropping the Brooklyn born boxer during a moment in sparring. “It is absolutely not out of the realms of possibilities,” Kavanagh said of a showdown between Malignaggi and McGregor while on the Joe Rogan Experience. 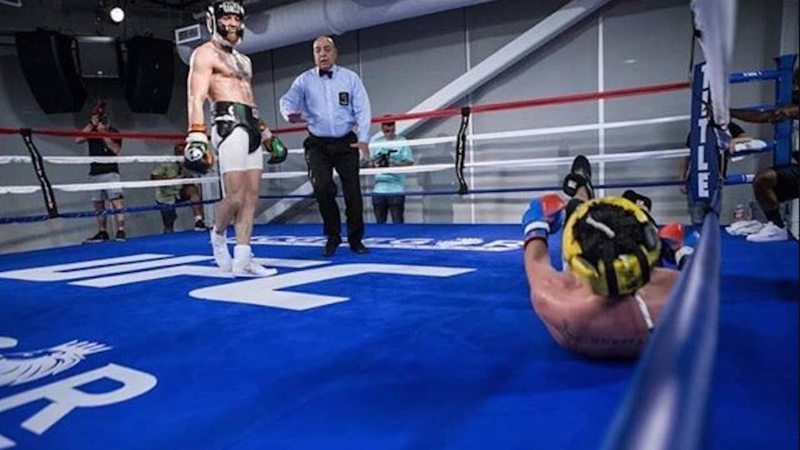 Malignaggi has insisted that the photos and footage were manipulated to show that McGregor had given him a beating, which he claims was not the case. Kavanagh revealed the footage of the sparring session will be featured in an upcoming three part documentary series on McGregor, produced by Netflix. “I think there is something being released on Netflix soon based around that fight and it’ll have all the rounds,” Kavanagh said. “We have the 12 rounds. As far as I’m aware, I just did an interview for it recently. I think it’s a three part documentary that’s going to be on Netflix soon. So people will get to make up their own minds about it.